I’ve found this interesting blog by Flylogic Engineering, a company that focuses on hardware security analysis. In their blog, they examine several popular microcontrollers and other ICs pointing out some interesting details in their design and possible attack vectors. 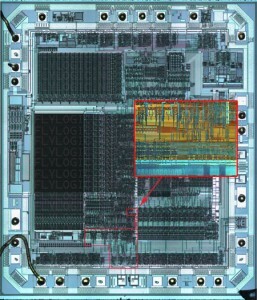 In their analysis, they take a look at security at the hardware level by extracting the IC die from its package and taking a look at the silicon under a microscope. They then remove each metalization layer, one at a time, photographing each layer as they make their way down to the lower levels. I find this fascinating and highly recommend that you take a look.